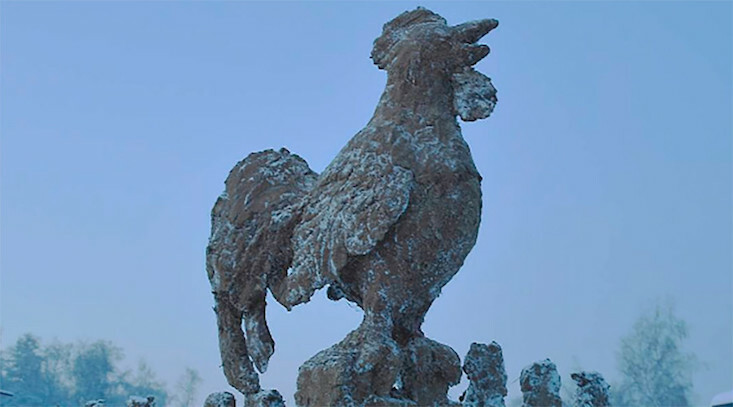 Siberian artist Mikhail Bopposov has marked the new year with a massive sculpture of a rooster, entirely made from frozen manure. Bopposov, who hails from the remote village of Uolba in Russia's Sakha Republic, celebrates each new year with a dung sculpture of the relevant Chinese zodiac symbol. In spite of delays to the project, owing to a stay in hospital for Bopposov, the 3.5m-tall and 4.2m-long masterpiece was completed in the nick of time on 31 December. The sculpture is expected to melt when the spring sunshine arrives, surely bringing with it a delightful fragrance.